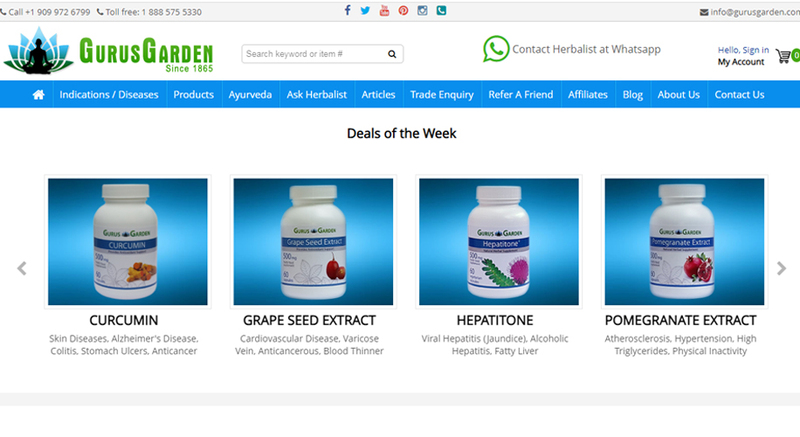 Gurus Garden offers a range of herbal food supplements for people suffering from variety of conditions. The healing powers of herbs were known to the ancient people of India, who have developed Ayurveda, the Science of Life and Living. Today, modern medicine too uses different herbal extracts for preparing medications for specific conditions. Gurus Garden take the necessary steps required to pass the knowledge of life to benefit of whole humankind. We have a variety of products, each one developed several decades ago and for curing specific conditions and strengthening physique. Gurus Garden works towards the standardization of herbal compounds, and making the formula preparations available as easy to ship and consume tablets, capsules and packaging. Gurus Garden work according to the standards and guidelines set by FDA and comparable regulatory bodies in other countries. We ensure supply of highest grade food supplements that protect and nourish human body and prevent diseases from attacking the body. Ayurveda, which translates into ‘the science of life’ or ‘the knowledge of life’ has long been the default lifestyle and medicine system for the people of India for many centuries. Gurus Garden uses traditional Ayurvedic food supplements used as medicines in India for many centuries for people suffering from conditions varying from heart diseases, arthritis, skin problem, liver diseases, headache, etc. Gurus Garden presently has 11 different formulations specifically designed for different conditions ranging from skin problems to liver and heart problems. The formulations have been in use for several decades to many centuries. People in different parts of India use these herbal formulations to lead a healthy life with a strong body and well functioning blood vessels, heart, liver and other internal organs. Gurus Garden now make available these wonderful herbal food supplements for the benefit of humankind. Each product has the backing of documentation of detailed usage history of the herbal formulations. Different herbs have different properties and when combined, they exhibit even newer properties. Gurus Garden conduct scientific tests and experiments to determine the effectiveness of the herbal combinations. Each remedial food supplement or herbal combination is passed through scientific tests like double-blind placebo tests. The traditional herbal medicines take extremely difficult form, which is hard to pack and ship. Our researches concentrate on making such formulations available in tablet or capsule forms, for safe packaging, longer shelf-life and for easy consumption. Gurus Garden put in place scientifically approved methodologies to test, document and report the benefits of herbal food supplements that promote healing, build immunity and strengthens body. Most of the food supplements require no prescription and are available for over the counter purchase. We will strive to serve our Customers with excellence in every aspect of their interaction with us. We will be Transparent in dealing with our Customers and Strive to always be respected as a model organisation.